Hog Island boas are an island variety of common boa. The two main differences are size and colouration. Hog Island boas are naturally hypomelanistic (low in black pigment). This allows the other colours to stand out more, giving a lovely muted pattern of light browns and pinks to orange and even blue. Adult female common boas may reach 12 feet but it is very rare for a Hog Island boa to get above 6 feet and males generally reach 4 feet. Common boas would make great first snakes if it were not for their adult size. The smaller size of the Hog Island boa makes it a great alternative to the often fussy royal python as a choice of first snake. This Hog Island boa care sheet sets out the basics for you. Obviously the other “advantage” the Hog Island boa has over the larger commons is that being smaller, they require less space, allowing for a smaller enclosure. The old rule of thumb, length of vivarium plus depth of vivarium equals length of snake shows a three foot vivarium large enough for all but the largest specimens and a four foot enough for even a large female. So for someone wanting a boa but without the space (or the funds) to house a large common, the Hog Island boa makes an obvious choice. As to keeping a smaller Hog Island boa in a small box until it is bigger and more confident. Can you? Well, yes you can. Do you have to? Well, no you don’t. 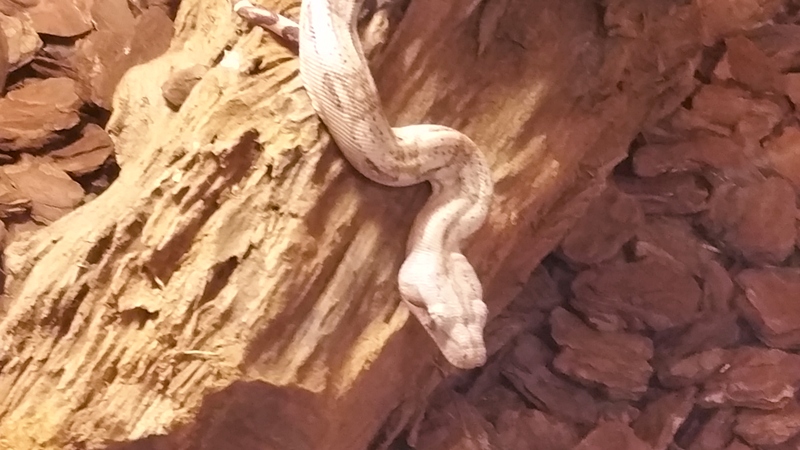 If you want to house a young Hog Island boa in the vivarium that will last into adulthood and beyond, that is fine. Just ensure there are plenty of places for it to hide away in different areas of the viv. The Hog Island boa comes from the tropical Cayos Cachinos Islands off the coast of Honduras. So they need heat and a reasonable level of humidity (although not wet). Around 29C at the hot end and a humidity level of around 60% is fine. I prefer heating with a ceramic heat emitter and this must have a cage around it to prevent contact with the snake and consequent burns. Due to the smaller size of the Hog Island boa you could use a heat mat (mounted on the end wall of the viv. to prevent thermal blocking). 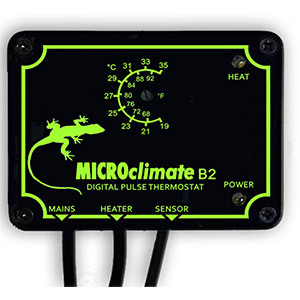 Which ever you use, a thermostat to control the temperature is essential. Over heating will damage a snake much more quickly than under heating. Of the two methods of heating mentioned, heat mats and on/off thermostats are cheaper, whilst ceramics and pulse proportional thermostats give a finer level of control. The Hog Island boa generally does not require specialist lighting but why have a snake in a vivarium and then not be able to see it? I find the best modern solution to be LED lighting. Most are neat, quite stylish, don’t generate heat so don’t need to be guarded, can come in a variety of colours (some will automatically change from day to night lighting if you want to be flash), are low voltage inside the viv, are energy efficient, last the lifetime of the snake so don’t require regular replacement of blown lamps…As you can see I am quite sold on them. However properly guarded incandescent lamps can be used (but take the heat generated into consideration) and fluorescent tubes work well but will need to be replaced occasionally. I prefer bark chips (orchid bark) for a Hog Island boa. The dark colour sets off the snake well and this substrate works well as a holder of moisture, helping to maintain some humidity. Other substrates can be used, aspen, lignocel, beech chip, cage carpet etc. Humidity can be maintained by positioning of the water bowl – at the hot end increases humidity as the water evaporates. Water should be changed daily anyway so it will not be there long enough for it all to disappear. In the end the choice of substrate is yours, most cost around the same so that shouldn’t be a factor. Whatever you want for your Hog Island boa. As with most snakes, a hide of some description is a must so the Hog Island boa has somewhere to go when it feels the need to be secure. More than one is better, so the snake can choose the temperature of the hide it wants to use. A hide is also a good place to put some damp moss for localised increase of humidity when shedding. Some form of branch is good (environmental or habitat enrichment to get all professional) to allow climbing behaviour. Aside from these it’s your viv. so it’s your choice. 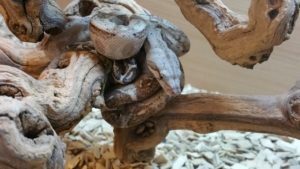 Silk plants are an attractive addition to a vivarium (real plants work too but you may spend more time looking after them than the Hog Island boa) and of course a skull always looks good with a snake coming out the eye socket. No? Just me then. Apart from an Amazon Tree Boa I had once (there is always one), every boa I have had has been a good feeder. The Hog Island boa is no exception. I have heard that they can go off their food if they feel insecure but if you have the correct set up in your vivarium this is not going to happen. Mice for smaller specimens is fine but I would get onto rats as soon as possible as larger ones are going to need larger food and there is a possibility it could get habituated to mice. Not the Hog Island boa examples I have had though. They eat anything (well not really anything but you get the point). As with any snake, don’t feed too large a mouse or rat though. There are a lot of risks associated with this, from refusing food to regurgitating later to damage to the insides of the snake from sharp rat claws etc. It’s just not worth risking it for no perceivable benefit to the snake. I feed once a week on smaller food up to once every two weeks for larger. The snake will let you know. Oh and I always use tongs for feeding. A nice smell of rat coupled with a nice warm hand can result in a snake striking at the wrong thing. A Hog Island boa is no exception to this potential confusion.